It all starts with what's inside! Solar Air Heating Systems can be designed and supplied as specified by a customers needs and application. The required hot air temperature is not limited by a single sized panel. System life is more than 20 years without any additional maintenance. Lowest cost, pay-back period is shorter - less than 2 years. Most solar air heaters work on the same principle as a greenhouse wherein sunlight is converted to heat within a glass or plastic covered enclosure. The heat is then trapped in the enclosure by the glass or plastic. Solar heating is an economical way for persons to augment the heating of homes and other buildings. The devices can be economical to build or buy and energy from the sun is free. Still, older style devices are not as efficient as homeowners or other building owners would like. The reason for this, at least in part, is because cold incoming air is allowed to mix with the heated air in the solar air heater. Such mixing decreases the average temperature of the air in the heater and, thus, reduces the overall efficiency of the heater. Solar air heaters have tried to increase efficiency by one or more of, for example, increasing the size of the heater, increasing the surface area for radiant energy absorbance within the heater without increasing external surface area or increasing the layers of clear, transparent or translucent material covering the device. 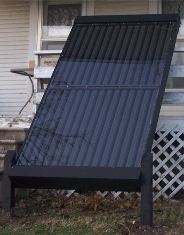 One older style solar air heater is described in the book "Solar Air Heater" (Ray Wolf, Rodale Plans, 1981). 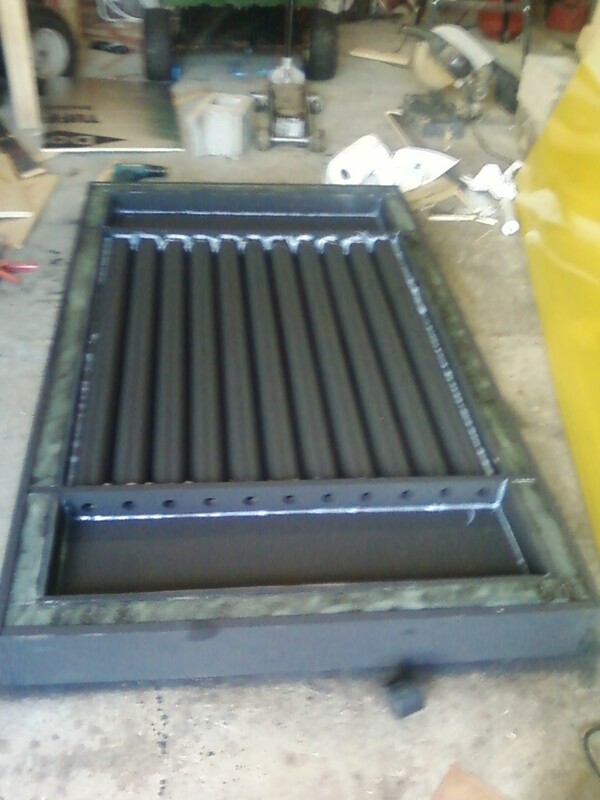 This solar air heater tries to increase efficiency by increasing the surface area of the heater. This heater is described as a 4 foot by 8 foot enclosed space covered with translucent fiberglass cloth where cold room air is forced into the device at the base, heated by solar energy and then expelled from outlets at the top back into the room. The enclosure is one large area where cold air can mix with warmer air thereby bringing down the average temperature of the air within the device and, thus, lessening the temperature of the air being expelled back into the room. Additionally, the device is designed to permanently mount on an external wall of the building. Many homes may not have such an expanse of wall space conveniently located for both best sun exposure and best room air exchange. In one aspect, the 1500 Series relates to a solar air heater wherein the enclosed space within the device housing is divided into several essentially isolated sections by a partition. The partition(s) of the 1500 Series solar air heaters are parallel to each other and to the top and bottom panels of the enclosure. The partition(s) of the enclosure contact the side panels perpendicularly and contact the front and back panels at a non-perpendicular angle. Furthermore, the partitions of the 1500 Series comprise a plurality of channels allowing adjacent sections to be in fluid communication with each other. The channels are small enough in diameter to prevent any significant back flow of air. This design not only solves the older style solar air heater problem of incoming cold air mixing with the heated air within the heater but also provides the unsuspected benefit of increased heater efficiency by heating the air in a step-wise manner. This step-wise heating of the air, where the heated air of one section provides the starting air of the next adjacent section, results in a greater temperature gain as compared to a similar sized device not incorporating the step-wise heating technology of the 1500 Series. Additionally, the partitions of the solar heater of the 1500 Series also aid in the heating of the air. The partitions of the 1500 Series, in one embodiment, are made of materials and or colors which are known to absorb solar radiant energy thereby proving additional heating of the air as it passes through the channels of the partitions.